In this section, we propose a non-intrusive mechanism to motorize the head rotation of a KEMAR HATS. It includes a silent brushless motor and two limit sensors to constrain the admissible rotation range, assembled with designed aluminium parts that preserve the original neck thickness and shape. The mechanism, placing the motor inside the torso, is visible on Fig. 3. The instructions below detail how to set up this mechanism to get a motorized KEMAR head. You first need to make the three aluminium pieces, visible in blue, red and green on Fig. 3. CAD models are available in the kemar-hardware repository, in folder motorized-neck/mechanics. File head.stp is the blue piece, fixed to the head. File torso.stp is the red piece, fixed to the torso. File rotation.stp is the green piece, fixed to the rotating axis of the motor. Last, file assembly.stp shows the pieces assembled together with the motor, it can help having a look at it while you mount the mechanism. Remove the original part below the head and place the new head piece (blue). Keep and reuse the same screws. As this part will be placed above the proximity optical sensors, an anti-reflection adhesive film must be stuck to prevent any reflection (see Fig. 4). The two audio cables can be passed through the arc-shaped hole. Assemble the motor to the new aluminium part that will be fixed to the torso (red) with four M4 screws. The arc-shaped hole will go at the rear of the new neck. 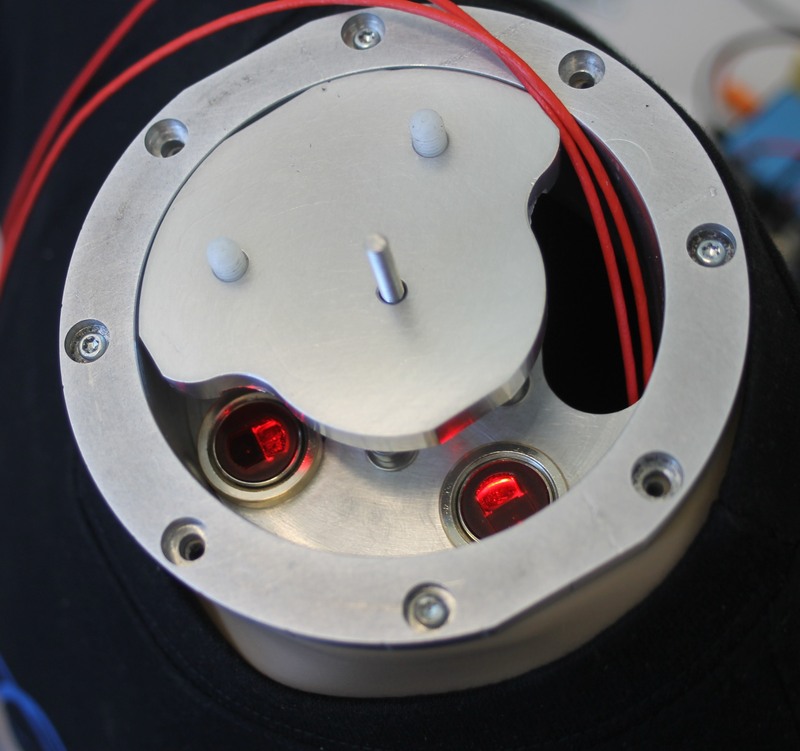 Place the two optical sensors into the dedicated holes (one on front, the second on left side). The nuts provided with the sensors are too big to be placed direcly. Nuts must be rounded first to be integrated. 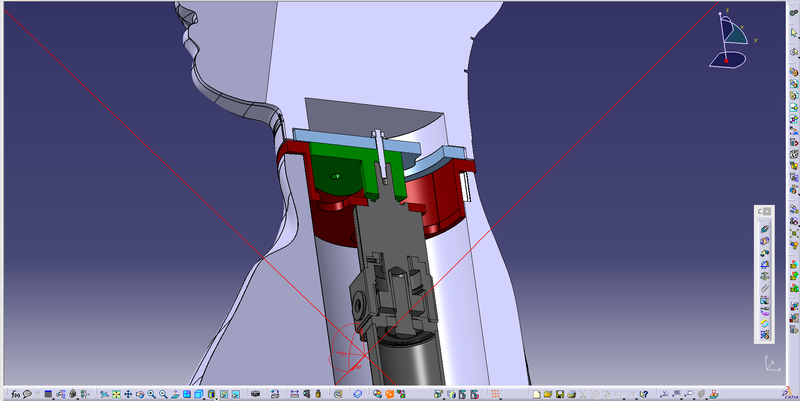 On the last aluminium piece (green), place two plastic screws for head alignment (see Fig. 5). They will fit in the two corresponding holes on the head piece. Then position the rotating piece (green) on the motor shaft. There is a groove on the shaft. Align the two hexagonal screws with the groove and fix them. Before placing the motor block at the top of the torso, optical sensor sensitivity must be adjusted on both sensors. Place the head and supply the sensors with +24V DC. Check that output sensors toggle when the head turns, otherwise tune the yellow screw on sensors to adjust. Then remove the head. Remove the original black piece fixed on top of the torso, keep the screws. Place the motor block set at the top of the torso and screw it using these screws. Pass the audio cables into the torso, place the head on the neck and screw it. 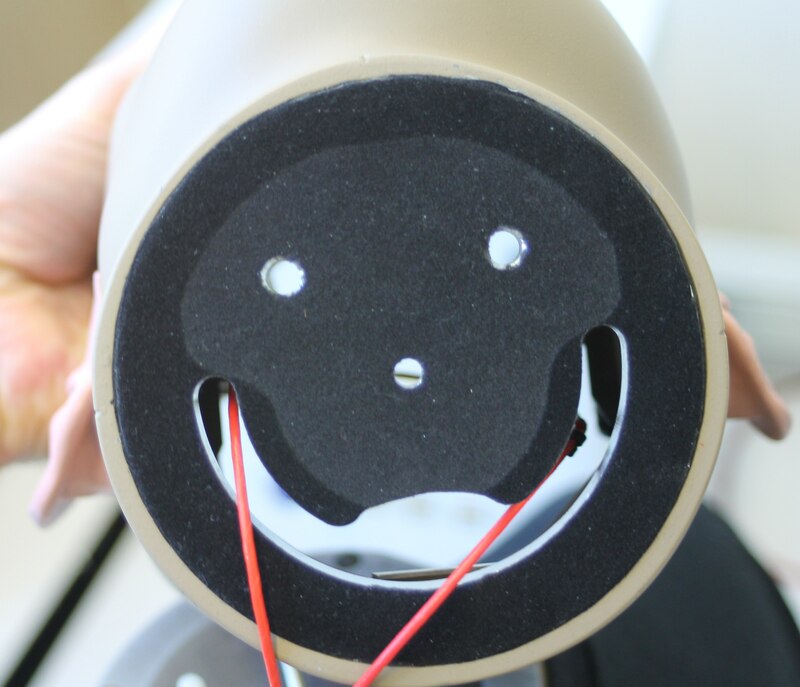 The role of the two limit sensors is to contrain the head rotation between -90° and +90°, for human-like rotation and to avoid harms on the microphone cables. A dedicated PCB must be manufactured. Table 4 lists the needed components, and Gerber files for the PCB are available in the kemar-hardware repository, in folder motorized-neck/electronics. Before switching the power supply ON, be sure to have connected all the listed elements. Connect the ELMO Controller (J3 connector) and the motor block set (incremental encoder + Hall effect sensors) using cable CBLIC-BAS-J3. Connect limit detection PCB (J6 connector) to ELMO Controller (J5 connector). J6.6 → J5.7 (ELMO Programmable input return). Connect the ELMO Controller (J4 connector) to an auxiliary +24V DC power supply using cable CBLIC-BAS-J4. If an auxiliary power supply is not available connect the cable to the +24V DC main power supply. J4.2 → Power supply return. Connect the ELMO Controller (J1 -RJ-45 plug) to a RJ-45 to 9-pin D-sub adapter using an ethernet cable. The 9-pin D-sub connector is normalized according to CAN protocol. J1.3 (CAN GND) → 9-pin D-sub, pin 3. Do not forget to solder a 120 Ohms termination resistor between pin 7 and pin 2 of 9-pin D-sub adapter. Connect the ELMO Controller (J8 connector), available on the side of the controller to the motor phases and main power supply. J8.7 (M3) → motor phase 3. There are no constraints in the pinning of M1, M2 and M3. J3.8 → + (brown), front sensor. Place jumpers on J4 and J5 connectors between GND and center pin. The example chapter includes a simple use of this component to Control the rotation of a KEMAR motorized head from Matlab.